This article details the phenomenon of the walk-off balk, updated most recently in July 2016 after the Padres walk-off balk. The original version of this post was about how on June 18, 2015, the Los Angeles Dodgers beat the Texas Rangers 1-0 by scoring the game’s only run in the bottom of the 9th inning off rookie reliever Keone Kela. Such a victory, where the home team scores the game-winning run in the 9th inning or later, is a walk-off. Most walk-offs occur on hits, but some with sacrifice flies, errors, or even walks. Walk-off home runs are the cause of huge celebration on the field and can earn the players who hit them a rank of clutch or the title of hero. However, the Dodgers scored their lone run without their final batter even leaving the batter’s box. How is that possible? A little nuisance called a balk, which Kela committed with his ever-so-slight flinch with pinch-runner Enrique Hernandez faking a break toward home from third base. This Dodgers walk-off balk (balk-off) made lots of baseball fanatics think about this event that has happened so very infrequently in the history of Major League Baseball. As you can see in my list above, the Dodgers’ Enrique Hernandez became only the 3rd pinch-runner to score a game-winning run on a balk by the opposing team. Also, this was the second time the Texas Rangers have balked in the winning run in the past 15 years…pull yourself together Rangers relievers! The first 7 balk-offs on the list – and 9 of the 21 overall – occurred with the bases loaded. What’s more, of all these walk-off balks, the winning runner was the lone baserunner (man on third) just twice…the last 2 times for the Dodgers. Another cool observation: nearly half (10/21) of the balk-offs in MLB history (past 100 years) have been in extra innings, including the Padres’ walk-off balk this year after coming back when down 5-6 in the last frame of the 10th inning. Perhaps the strangest part about those bizarre endings is that a few of the pitchers who balked in a game-winning run officially faced zero batters in the game. Johnny Sain, Warren Brusstar, Todd Fischer, and Mike Stanton were all at fault for allowing their respective opponent’s winning run to score, but none of these pitchers had an official at-bat or plate appearance recorded against them. Each of them entered the game with the eventual winning runner on third base and proceeded to balk before recording an out or allowing the batter to reach base. In fact, the Nationals Mike Stanton did not even throw a single pitch to Lyle Overbay. Instead he balked on a pick-off move in an attempt to catch Magruder at third. All 21 balk-offs in MLB history have occurred in the regular season, with 11 of the 21 occurring in April and May – early in the season maybe leads to pitchers not feeling quite as comfortable and balking more. Of the 143 playoff walk-off wins in the MLB from 1903 to 2015, none were balk-offs. In fact, only 3 of those 143 games featured 1 balk by the losing team. 1Sain wasn’t the losing pitchers, as he inherited the bases loaded from Manny Salvo. 2Walker didn’t get the loss, as he inherited Cedeno on 2nd base from Mike Marshall, the eventual losing pitcher for the ‘Stros. 3Brusstar was also not given the loss, as he inherited Parker on third from Steve Carlton. 4Mike Cook picked up the loss after he blew a 7-4 lead by giving up 3 runs in the bottom of the 12th before being pulled, leaving Evans on 3rd for Fischer. 5Rocker didn’t get the loss, but rather Rudy Seanez who let the eventual winning run walk to first. 6Stanton balked in Magruder, but it was Luis Ayala who was the eventual losing pitcher since he put the runner on third base. 7Alburquerque was not the losing pitcher because Phil Coke put the eventual winning runner Cabrera on base by hitting him with a pitch. Add July 16th bottom of the 10th balk-off for Santiago Casilla of the San Francisco Giants. On4-22-1939 Red Evans balked home Pinky May to give the Phils a walk-off 5-4 win over the Dodgers. I know I’m not going crazy and this turned me into a life long despiser of The Phillies. Dwight Gooden was pitching an absolute masterpiece only for a bleeping balk to do him in. 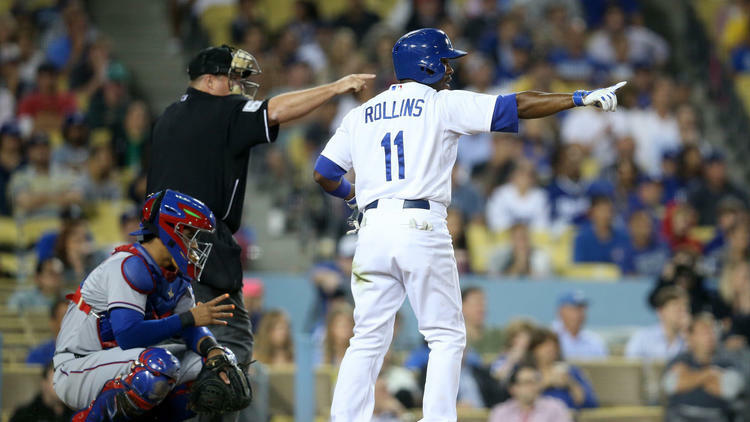 The Dodgers were involved in their 5th “balk-off” on July 18, 2018 against the Seattle Mariners in Seattle. This time, they were on the losing end. The game was in extra innings; in the bottom of the 10th, with the bases loaded. This puts the Dodgers at 3-2 in games called by balk, and constitutes their participation in 5 of the 22 balk-off baseball games recorded since 1914. Pardon me – I realized that my previous post was incorrect. The date of the L.A. Dodgers @ Seattle Mariners “balk-off” was August 18,2018. NOT July 18 as previously stated. My apologies.